Felton Davis Joanne Kennedy gives a quick astronomy lesson. If it were up to him, Felton Davis would install a 75-foot dome atop the communal shelter where he has lived for 25 years. But the Catholic Worker doesn’t have that kind of money, so he uses a simple telescope to show his fellow Maryhouse residents the wonders of the universe. Mr. Davis hosts informal viewings on the rooftop of the Catholic-anarchist hospitality house, but on a half dozen occasions, he’s taken his planet parties to the street. 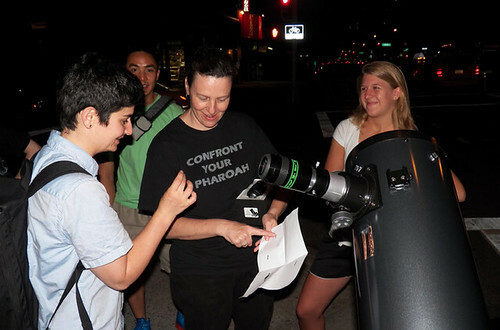 Saturday night, he took his Orion telescope and wide-angle Q70 lens to the corner of East Third Street and Second Avenue to give over a hundred passersby an intimate view of Saturn. Positioned next to a bright star in the Virgo constellation, the planet is imminently visible during these summer months.